West Boylston took a trip to Grafton High School Friday night to face off against the out-of-conference Indians. Grafton would take an early lead that it wouldn’t relinquish, cruising to a 37-6 victory. As big a game as this was for players, the coaches wanted to give a little extra push this week. West Boylston coach Mike Ross coached Grafton for years, winning a Super Bowl in 2012, and he hasn't been forgotten in Grafton. “Both coaches were fired up this week,” said Grafton star and Syracuse commit Ifeatu Melifonwu, whose brother Obi, now at UConn, played for Ross at Grafton. It was clear that both teams had game planned for each other. In the first half, the score remained close. The Lions’ defense seemed to be able to slow Grafton down enough to give their offense a chance to keep pace. Grafton was forced to punt twice in the first half, and a late-half drive was halted by an interception. All good signs for West Boylston, but the Indians found separation as the game went on. Ifeatu Melifonwu’s performance was about what you’d expect to see when you stick a D1 commit behind a stout offensive line: Dominant. Again, the Lions had the strategy in place to stick this game out, but how can you really plan against a guy running through multiple tackles and then pulling away from the pack? Melifonwu found the end zone from 26, 45, and 54 yards out. This makes an offense’s job easy and a defense’s job a nightmare. The Indians weren’t able to engineer long, methodical drives against the Lions’ defense, but they didn't need to. Three plays could land them in the end zone when the ball was in Melifonwu's hands. On the flip side, the Indians defense had a plan of their own. 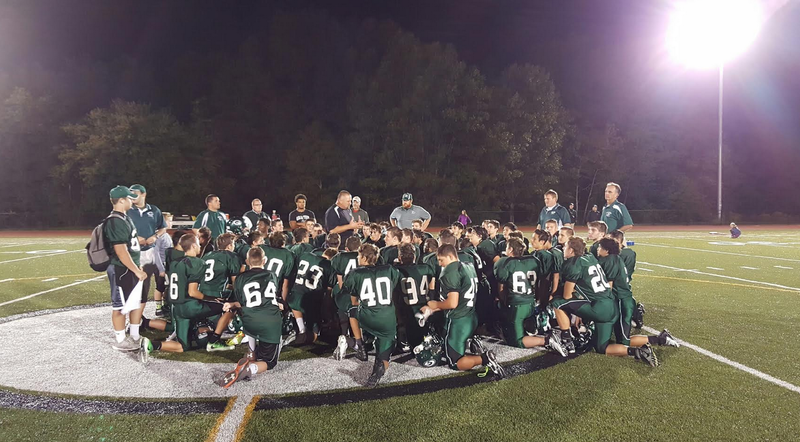 “We practiced all week for this,” Deely said when asked about Grafton's defensive performance. “We knew what to do against the double-wing. We executed the game plan well,” added Melifonwu. 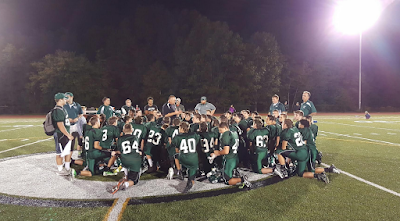 Grafton’s coaches are well acquainted with Coach Ross’ signature offense, as many of them were members of his staff during his tenure at Grafton. You can be sure there was intensive instruction on how to combat the run-heavy offense this week. That being said, no one was going to stop Cole McCubrey from finding the end zone at some point this game. The kid is a tank and runs like it. Here’s a guy who’s not afraid to put his head down and take the punishment, pounding the ball up the middle play after play. In the end though, the Indians and Lions both played good defense throughout the contest. The big difference in this one was the big plays that Grafton was able to capitalize on. The score in this game was truly lopsided. However the play-by-play reveals something interesting. Though the Lions allowed 34 points in this contest, the defense was good about getting off the field. The Indians had ten drives in the game. Only two of these lasted seven plays (one resulted in a touchdown, one an interception). None of the Indians’ other three scoring drives consisted of more than three plays. The remaining five drives by Grafton’s offense went punt, punt, punt, fumble, punt. What this screams is that, if this West Boylston defense seals up the holes that allowed those big plays earlier in the game, the score at the end doesn’t look nearly as exaggerated. As for the offense, quarterback Brian Mercier went down in the second half. That may be a painful loss if he is out for any extended period of time, as he ran the offense with serious confidence. Backup Ryan Grady stepped in and made some nice throws to extend a few drives, and his presence should reassure his teammates should Mercier not return right away. In addition, Cole McCubrey will be a guy to lean on for this smash mouth style offense, as he is a force to be reckoned with on the field. All in all, the Lions should be able to shake this one off. There’s plenty of football left to play this season and a few small changes could put this team right there in playoff contention. This is a team that has an explosive offense, a tough defense and a ton of depth. Though Melifonwu had a monster game, he’s not a one-man show by any means. Running back Ethan Farrah ran quite well, racking up decent yards for the Indians. He even had a 73-yard touchdown that made everyone on the field look like they were in slow motion (unfortunately for Farrah, this touchdown was called back for a block in the back penalty). Wide receiver J.D. Bailey came in in the red zone late in the game to make a crazy overhead catch for his first career touchdown. J.D. would later speak little of himself and much of his teammates. As for the defense, guys were playing well all over the place. “Brady Fontana and Jackson Sonnett stepped up and had huge games! Matt Holbrook had a pick-6,” Coach McMahon said after the game. McMahon also cited running back John Harrington as an example of what they look for at Grafton. In other words, just as Coach McMahon had discussed during our preseason preview, Grafton will be a team of workhorses looking to step up to every opportunity. If Grafton sticks to its mantra and continues to make big plays, it’s likely we will be still be watching them in late November.